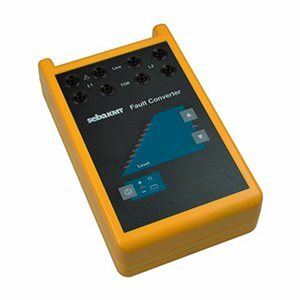 The fault converter is an add on for reflectometers for the detection of humidity faults, especially in communication cables. The measuring signal of the reflectometer receives by the fault converter a DC offset of up to 200 V with changing polarity. This DC change the begin causes at the humid or wet area a galvanic reaction which becomes visible as an amplitude change of the measuring impulse. It is recommended to use a dual input unit TDR2000/3, since the best approach is the use of differential or IFL mode to make the fault visible.